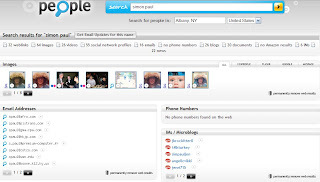 123 People is a people search engine that allows you search people around the world. It is not like yellow page you can find people directly but you can use it to search people who often use internet, join social network, or email address. The search result displays included picture, video, social network ID, email address, website. 123 People based on Austria, originally covering only Europe but now it enlarges international searching. Of course, you can use it to search people in USA. I think it is for younger people, because most younger people like use internet, it much easier to search them than old people who have less internet activities.